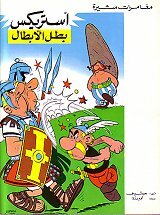 Some Asterix adventures were serialized in the weekly Lebanese comics magazine Bissat El -Reeh in the late 70s and early 80s. The journal Basem published three stories : Gaulois , Serpe  and Normands  around 2000. The first 3 albums where printen by Dar El Maaref in Lebanon, way before the last four which where printed in Egypt. On the backcover is another (8th) title mentioned:  أستريكس و العراف (Asterīks wa-l-carrāf), but the Arabic speaking comics community highly doubt whether it really exists. Info supplied by Mohamed Saad. Thank you Christian for the expert typing.